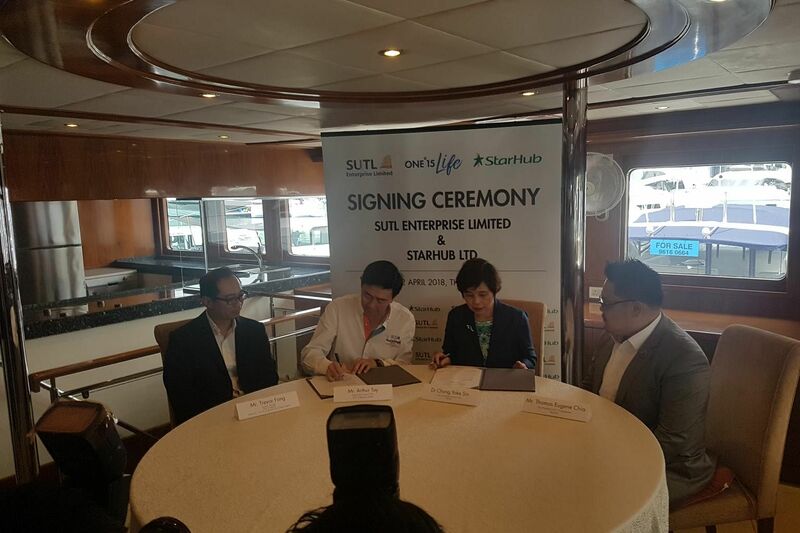 SINGAPORE - Marina developer and operator SUTL Enterprise has inked a deal with telco StarHub to launch a peer-to-peer digital marketplace for marina-related services like yacht charters, private jet hires. At the signing on Thursday (April 12), general manager of ONE°15 Marina (Malaysia, China & North Asia) and special projects Trevor Fong, who spearheads the marketplace, dubbed ONE°15 Life, said that he was inspired by the large number of unused yachts in the marina. He said: "This excess capacity needs to convert somehow to the people who can enjoy it, not just the very well-to-do but also the not so well-to-do." Just like other service marketplaces, asset providers, such as yacht owners, will be able to list their assets for use and set the price they want. Consumers will then be able to view the pictures and videos of the service they are interested in and pay for it online. In addition, SUTL Enterprise said that the platform will also bring on board other complementary service providers, which can provide optional add-ons such as watersport equipment rental and F&B (food and beverage) catering in the case of yacht charters. The mainboard-listed company said that ONE°15 Life will be released in phases. The first phase, comprising yacht charters, is set to be operational in the third quarter of this year. SUTL Enterprise pointed out that the digital marketplace will be driven by an artificial intelligence (AI)-ready recommendation engine, which will suggest activities and experiences based on the registered profiles of its users. Mr Fong said: "The traditional way of chartering yachts can be quite daunting and tedious as it involves long discussions and negotiations that are done through brokers. With ONE°15 Life's automated recommendation capability, we hope to address this by simplifying the process." On the choice of StarHub as a partner, SUTL Enterprise chief executive Arthur Tay said: "With its omni-present channels and island wide network, StarHub is able to deliver not just the communications and tech solutions that SUTL needs, but also media coverage, to our target markets and audience." Chong Yoke Sin, the head of StarHub's enterprise business group, said: "We are excited to be the transformation partner for SUTL, helping them build stronger digital capabilities to seize local and regional growth opportunities in the digital economy. "We will be using the anonymised data analytics generated from our consumer business to help SUTL maximise their marketing efforts."